Sometimes reading through the contributions to the Bongo Forum can be a bit depressing. Owners asking for solutions to technical problems. Complaints about service. Grumbles about the youth of today. That sort of thing. So it is quite refreshing to come across something positive for a change. Alison01326 reports. “Well, this has come round very quickly. We have had our Bongo (known as Seymour) for a year and I’m as delighted with it now as I was the day I picked it up (well, the day we put down the deposit really). I’ve chronicled various experiences with it on here, and at the risk of repeating myself, I’m hoping this may be of interest to the newer members to the forum particularly those contemplating Bongo ownership or just embarking on same. While I was expecting the boy we were thinking of replacing my Fiat Multipla with another MPV, preferably with a sliding door, and we did the rounds of all the main dealers and there was nothing which really caught our eye except a Land Rover Disco complete with Aztec Autohaven rear tent awning thingy. That appealed most of all but the price was beyond that of mere mortals such as ourselves. 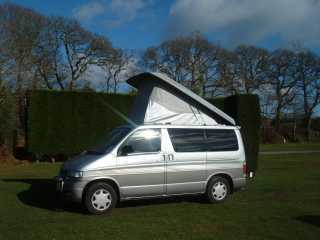 Shortly after that we saw a Bongo parked up at Slapton (near the tank) in July or August 2005 and had a good peer in through the windows and thought that it would be an excellent replacement for the Multipla. There was one for sale at the end of our road, but it’s bodywork wasn’t great. We all but forgot about it in the flurry of new baby and jobless husband and the subject didn’t come up again until September 2008 when we had spent 10 days on holiday divided between Youth Hostels and Travelodges and averaged £60 per night for accommodation. We decided to look for a Bongo when we got home, and coincidentally we saw one at Stansted and got the boy’s seal of approval. On the way home from Newquay Airport, we spotted the Mazda Bongo Co (or rather the boy shouted “A Bongo Shop” at the same time as we noticed it – funny how we use that road several times a year and have never noticed before) So we went back a week or so later for a crash course in all things Bongo and for a look around. At this time we knew little about the beasties (I did not discover Bongo Fury until after we had committed to buy, and it was nearly three months before I discovered the Forum ). The only criteria we went armed with was colour (had to be silver), price (had to be able to afford it) and it had to be lower mileage than the car we were replacing (72,000 miles). We added diesel and split folding rear seats to the list having found out the options and there was Seymour ticking all the boxes. 1998 (R) silver, split rear seats, diesel, 4WD auto (wasn’t sure about that), within budget and with just a little over 56000 km on the clock. And all the paperwork. Hubby checked the engine and underneath and we had to have a test drive. Test drive completed, we paid the deposit, looked at conversion options (the Mazda Bongo Co use Clearcut Conversions and had some converted Bongos on the forecourt), decided that a removable rear “weekender” would be just the job for what was to be the main family car so ordered one of those, asked for the alloys to be taken off and replaced with steel wheels and away we went. I didn’t have any changes of heart (possibly would have done if I’d known about this Forum) unlike the three other car purchases I have made, ie “I’ve spent HOW much?”. And here we are twelve months on having had a couple of minor electrical niggles, with no mechanical problems, a clear MOT pass (no advisories) a couple of weeks ago. Along the way we have bought aLeisure Battery, a Willinton split charge kit, Royal Traveller Annexe (tunnel awning), a Royal Utility Tent (for when it’s just two of us), and an Easi Canopi (don’t know what my excuse was but it’s useful), had the wiring to the rear 12v socket improved, about to have another 12v socket put in on the other side, fitted a hi – lo coolant alarm and a mason alarm, replaced the space saver with a steel wheel, bought a rain cover for the AFT (improves insulation no end), and burned the rest of the budget on a Webasto diesel heater. I intend to keep Seymour until it’s at least as old as my husband’s car (which means I’ve got about 25 years to go). The boy often says “Thank you Seymour for a lovely day” when we get home so I shall publicly thank Seymour for his sterling work and realiability so far and urge those of you who haven’t got a Bongo yet to find a good one and GET ON WITH IT! The only downside to owning a Bongo is my enthusiasm for it – I am getting very very boring (and a bit evangelical, I think).